Common from 1122 (Mosaic Portrait of Alexius Comnenus from 1122 – Byzantine (Art of The Byzantine Era, pg 120), Emperor John II Comnenus in Sancta Sophia ~1118 (Art of The Byzantine Era, pg 120) ). 1259 Wall painting at Boyana of the donar near Sophia; the hat is on Queen Dessislava, painting inscriptions are in Slavic script (Art of The Byzantine Era, pg 189). Also, the Head of King Uros in Church or the Trinity at Sopocani ~ 1265 (Art of The Byzantine Era, pg 201). For a hat with a fur trim there is a painting of Saint Jacob of Persia at Staro Nagoricino which has fur trimmed and is from ~1317 (Art of The Byzantine Era, pg 204). 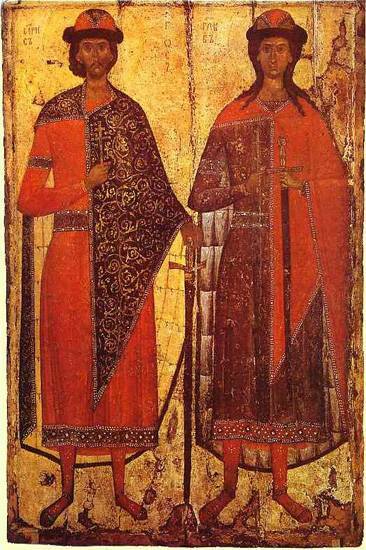 14th-century icon of Sts Boris and Gleb from the State Russian Museum. 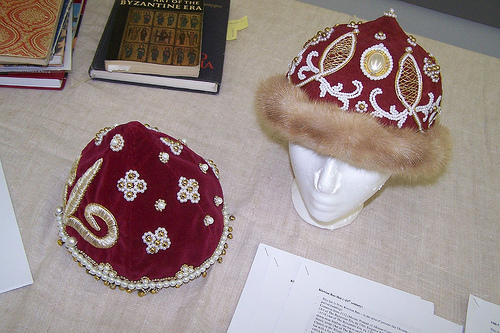 On Women these hats are seen in pictures of the Daughters of Yaroslav the Wise. There are two pictures one from 1651 manuscript that details a wall painting that was later painted over (See the picture in the Russian Historical Costume, pg 44, 45) and the second from a restoration of the original 11th century painting found on Wikipedia. 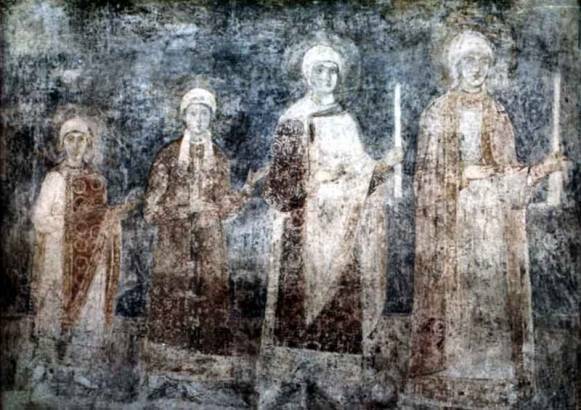 Daughters of Yaroslav the Wise. An 11th-century fresco from the St. Sophia Cathedral in Kiev. These hats would have been worn by the general populous; for warmth in colder climates, but the hats of wealthy would have been more elaborately decorated. 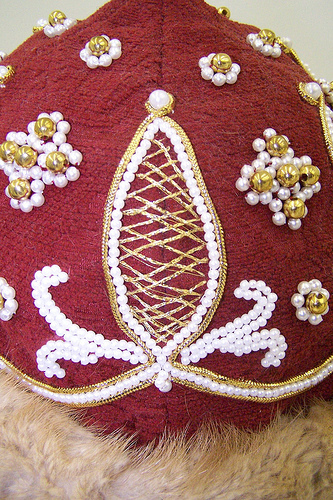 To make this hat synthetic brocade was used. Glass pearls, fake gold cord, and real mink fur was used for the decoration. It was interlined with heavy canvas to help the hat hold its shape and lined with synthetic “silk”. The reason for these choices was finances and availability. Next time I would use the correct materials to make the hat. Rice, David Talbot, “Art of The Byzantine Era”, Frederick A. Praeger Inc. Publishers, 3rd printing 1966. 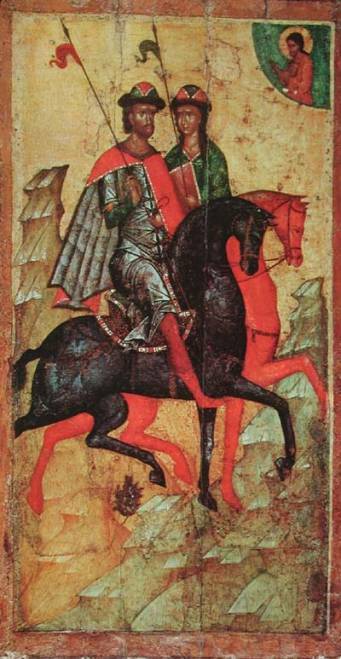 Smirnova, Engelina Sergeevna, “Zhivopis’ Velikogo Novgoroda (The Painting of the Great Novgorod 13 to 15th century)”, 1976. Giliarovskaia, Nadezhda V. “Russkii Istoricheskii Kostium (Russian Historical Costume)”, 1945.